The Zero Tolerance 0900 is a combination of premium materials designed by custom knife maker Les George. The 0900 is going to go down as one of the greats. My lovely wife asked me once “What makes a quality knife?” So I explained. Oh how she regretted asking that question (two hours later into our conversation). Ok, maybe I’m exaggerating a little here…but just a little. It’s hard for me not to get excited when talking about awesome knives. It’s almost like talking about James Bond and his 1965 Aston Martin DB5—my favorite Bond car. Just like the car, I think a quality knife should have premium materials, great performance, and an eye-catching design. The Zero Tolerance 0900 is one of those knives. This knife is going to draw some looks! At first glance, I knew I was going to really dig the stonewash finish. The silver/gray color seamlessly blends from the handle to the blade. The handle is made of titanium, which provides excellent corrosion resistance yet is lightweight. The blade material is S35VN steel, which the knife community refers to as one of the “super steels.” This super steel holds the edge much longer compared to the economic steels like 440. Above all, what really got me going was the blade shape and overall design. The curves and lines mesh together and are so pleasing to look at that it almost seems to say, “pick me up and hold me.” This great looking knife design can be credited to the partnership of custom knife designer Les George and Zero Tolerance. Ergonomically, this knife is very enjoyable to use. I think the size is near-perfect for an EDC knife. With the handle length at 3.9 inches, it provides a full 3 finger (and a slight pinky) grip on my medium size hand. Don’t let the smaller handle length scare you into thinking that this knife is dainty. The two slabs of titanium offered some great heft that provided a lot of substance in my hand. I recently handled the ZT 0900 knife with a somewhat oily hand, and it still felt totally secured. This surprised me because the titanium doesn’t have any texturing. What aided the secure and strong grip is the large jimping on the blade spine. The blade design is also thick and hearty with plenty of belly for deep cutting. I like the assurance of knowing my EDC knife is strong and able to withstand daily usage without the fear of failure. The balance of the Zero Tolerance 0900 is simply outstanding. What I really found amazing is the action in deploying the blade. Though it’s a manual flipper, the Zero Tolerance 0900 is very fast and smooth. No wrist action is required for deployment. The reason behind this is the KVT system—a manual opening system that enables smooth, easy blade deployment without the use of a spring or torsion bar to assist the blade out of the handle. Instead of a spring, the KVT system uses a series of ball bearings that surround the pivot point. 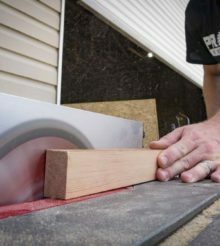 As a knife user pulls back on the flipper blade protrusion, the ball bearings rotate so that the blade glides out of the handle and then locks into place, ready for use. Locking, as you expect in a knife of this caliber, is solid. The oversized frame lock ensures the blade won’t be slipping back during use. This is particularly important with a blade design of this type. The short blade boasts a beefy height and practically begs to have its spine placed against material while the handle is pushed upward to cut plastic box bindings and rope. The frame lock vs liner lock debate will go on as long as both are made. Personally, I like both depending upon the knife. The frame lock on this model works really well and fits the design. With the complete stonewash finish and lack of texturing, it also adds an aesthetic element that makes you realize it’s not just a plain Jane folder. Overall I really enjoyed carrying the knife as an EDC. My only dislike is that the clip didn’t seem to hold strong enough in my pocket. Since I prefer a tip up carry, having only the two clip positions doesn’t bother me. On the other hand, those who prefer a tip down carry will need to know that it’s not an option on this design. With S35VN Super Steel and a titanium handle, the quality of the materials also drives up the cost. Retail on the Zero Tolerance 0900 is $240. However, you can find it for under $200 from several reputable online retailers. The design, materials, weight, and ergonomics make the ZT 0900 knife one of my new favorite EDC knives. With a blade length under three inches, you’ll be able to carry it in most areas that have blade length restrictions. It’s pretty clear that the Zero Tolerance 0900 is going to be one of the greats that we’ll still be talking about 20 years from now. Let’s meet socially! Follow Pro Tool Reviews on Facebook and Twitter! A contributing writer for Pro Tool Reviews, Steve is a father, devoted husband, sportsman, and an avid practitioner of the Wing Chun fighting style.